The list of services and benefits that Hospice Care provides is far longer than what it is unable to provide. Patients and family members experiencing hospice care discover it is about maintaining the highest quality of life for the patient. Statistically, families who have experienced hospice with a loved one were overwhelmingly satisfied with the care provided. For patients in Hospice Care, medications are administered to ease pain rather than treat the terminal illness, and the physical condition of the patient is constantly monitored to adjust care as needed. However, Hospice Care is much more than that. 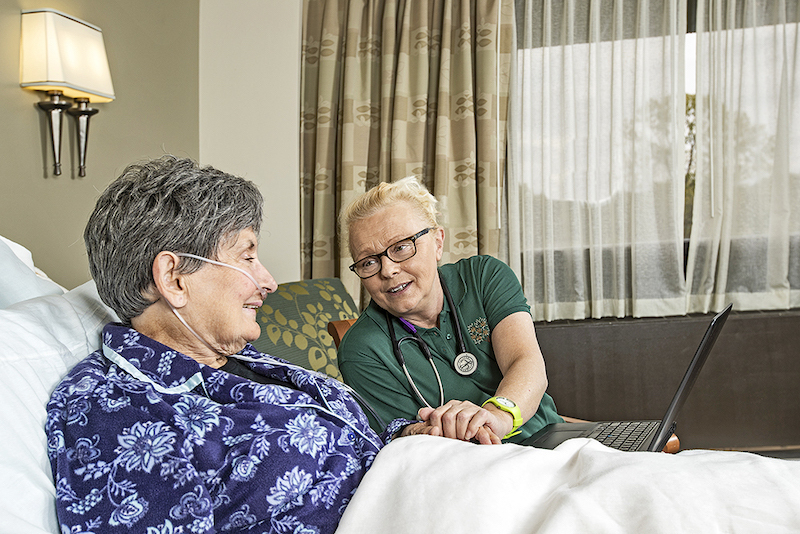 The Bethesda Hospice Care team coordinates respite care to provide rest for family/caregivers, reviews patients’ end-of-life wishes, and assists with funeral planning. The team is also trained to identify the unique needs of patients who are military veterans. Bereavement services start at admission and continue for 13 months. The care goals are initially focused on patient care in partnership with the family. Then, the focus shifts solely to the family in the bereavement process. One myth associated with Hospice Care is that it hastens the end of a patient’s life. On the contrary — the National Hospice and Palliative Care Organization states that patients live an average of 29 days longer in Hospice Care than in other alternative forms of end-of-life care. “The key to this benefit is entering hospice sooner rather than later,” says Deni. Medicare covers Hospice Care services and medications to manage pain and symptoms associated with the terminal illness, as recommended by the hospice team and the patient’s physician. It does not cover the cost of staying at senior communities while receiving Hospice Care. Unless the Hospice Care service is licensed by the state to provide care, Medicare may not provide reimbursement. According to Deni, Bethesda Hospice Care is state-licensed and undergoes periodic surveys by the Department of Health and Human Services to evaluate the quality of the care provided. 1. Hospice Care is only available during the last few days of life. Fact: Hospice Care is available at any point a physician certifies a person with a life-limiting illness has a life expectancy of six months or less. 2. Accepting a referral to Hospice Care means the patient and family have given up. Fact: Hospice Care is not about waiting to die. It is about making the most of the life the patient has left. 3. Hospice Care is expensive. Fact: Medicare and Medicaid provide coverage for Hospice Care patients. In 2014, the Medicare payment benefit for hospice fully covered 86 percent of all hospice patients. 4. Becoming a hospice patient means the patient loses all control. Fact: The expressed wishes and needs of the patient are the top priority for hospice. Bethesda offers Hospice Care services throughout the St. Louis area. Contact us to learn more about the benefits of Hospice Care and how Bethesda can support you and your loved one.